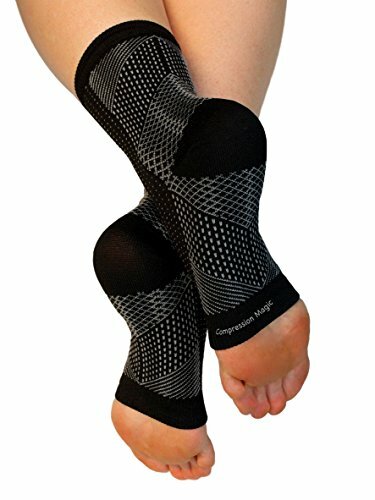 Compression Magic foot sleeves are proven to relieve sore, swollen and aching feet. They aid recovery from physical activity, standing for long periods or plantar fasciitis. Great firm fit, scroll up and see the product images above. Shipped in genuine Compression Magic packaging. ALLEVIATE DISCOMFORT – Perfect for relieving soreness from injury and other chronic conditions including plantar fasciitis. Ideal for athletes, enabling faster recovery after exercise. SMART TECHNOLOGY – Our unique design provides the perfect level of firmness, and at the same time offers flexibility to maximize blood flow all the way to your toes. IMPROVE YOUR FLEXIBILITY & ENDURANCE – Perfect for athletes and runners by reducing fatigue and promoting recovery after exercise. They won’t limit your ability to move like a night splint, so you can wear them for any activity. COMFORTABLE 7 ZONE DESIGN – Being toe-less they wick sweat away from your skin so you keep dry and cool. They are lightweight and comfortable so can be worn under athletic or fashion garments. 100% SATISFACTION GUARANTEE + EFFORTLESS CARE – Machine washable fabric, no hand-washing required. If for any reason, they don’t meet your needs, please let us know and we will give you your money back.